Everyone I know hates this hat. I saw it at Marshall's last week and had to have it. 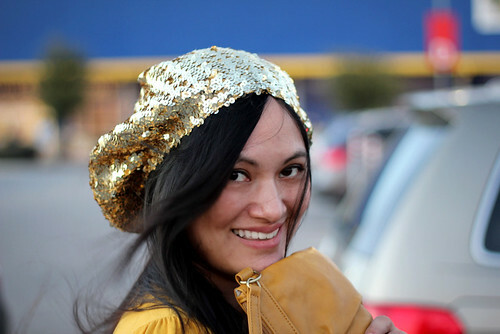 I've been jonesing for a sequined hat ever since I saw this hilarious post on Le Quaintrelle a long, long time ago. My mother, who I really think should do a side-by-side commentary of my blog told me "You look like New Year's Eve" when I wore this hat. Therefore, I thought it totally apropos that I actually wear it on New Year's Eve. For this new year, I'm starting a new project: Eleven improvements in 2011. One of my 11 goals is to vastly improve this blog. This means I'm going to be introducing a lot of gradual changes to Adored Austin this month, starting with the comment system. Instead of Blogger's commenting, I'm trying Disqus. Disqus is threaded, and it enables me to easily reply back to each and every comment that needs a reply. We can have conversations on this webpage, y'all! I've been wanting to improve my interaction capabilities on Adored Austin for a while, and this is just the start. I hope you like it. I'll post more about my 11 goals later this week. What about y'all? Any big new year's resolutions? At least this hat is adorable.